WiggleDoodle: Was Humpty Dumpty Really an Egg? Was Humpty Dumpty Really an Egg? Last night while sitting in the darkness during Earth Hour 2011, I suddenly remembered a segment on Sesame Street that I saw as a child (see bottom). It featured Kermit the Frog as a newsman and he was reporting Humpty Dumpty's fall and the efforts of the king's men and horses to put him back together. No where in the rhyme can we find that Humpty Dumpty was an egg. One can only deduce that he was one because all the king's men and horses could not put him back together after he fell from the wall. Therefore he was fragile and easily broken. What could be more fragile than an egg? I found several theories being put forward as to what Humpty Dumpty really was. One of these is that "Humpty Dumpty" was an old English slang for an obese person or a clumsy person who is prone to falling down. Another theory said that the rhyme started out as a riddle in the the early 1800s. Over time, everyone got the answer correctly (an egg) and the riddle was not asked anymore but became a popular children's rhyme. I also came upon a site which says that Humpty Dumpty was actually a powerful cannon used to defend a walled city called Colchester. The cannon was placed on a wall adjacent to St. Mary's Church. 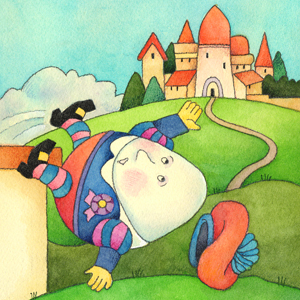 When the city was laid to siege, the wall was destroyed by a mortar and sent Humpty Dumpty falling to the ground. The cannon broke into pieces and all the king's men (infantry) and horses (cavalry) tried to fix it in vain. 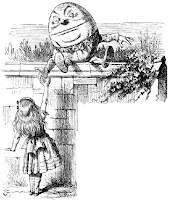 The most famous depiction of Humpty Dumpty was an illustration in Lewis Carroll's Through the Looking Glass. The picture, drawn by John Tenniel in 1871, shows Alice meeting Humpty Dumpty for the first time. In the story, Alice found Humpty Dumpty sitting on a wall with his legs crossed. The girl wondered how the egg could keep his balance. Humpty Dumpty engaged Alice in a conversation about words and their meanings which left the girl more confused than enlightened. In the Sesame Street segment, Humpty Dumpty was put together again. An overjoyed Kermit the Frog gave him a rather strong pat on the back that sent him falling off the wall again. The king's men and horses went back to work on fixing him, blaming the frog for the unfortunate incident. Equally baffling is why an egg would want to sit on a wall. That is, however, another good topic for discussion later. The iPad 2 is coming next week!